I was happy when I made these 2 characters of Mamegoma. Finally, I can showed the lid of the Mamegoma's lunch box hehehe ... how childish! We got a lot of Mamegoma's stationery. We here, mean my kids and I. I even got the Mamegoma's folder for my documents. We just love cute things ;) And before I forgot to explain, the blue nose was from fish ball that I soaked for a few minutes in the water with blue food coloring. I just wish we have the blue kamaboko here. MAMEGOMA is a series of world's smallest seal characters so it can put on your hand. The white one is called Shiro Goma and the pink one is called Sakura Goma. The seals are very playful, they love swimming in the water and waddle on land too. Besides Shiro Goma and Sakura Goma, they are still plenty of others like Beni Goma, Sora Goma, Kuro Goma, Shima Goma, etc. Inside the box : boiled brussel sprouts, chicken with oyster sauce, egg rolls & nori egg rolls, and beef sausages. I've missed seeing your cute bentos while I was away! Of course everything is super charming and perfectly executed! Everything you do is so perfect looking! I love the colors. The blue coloured fish ball really stand out from the bento! I love this bento a lot! Everything seems so charming! Overall the colour of this bento is sharp. Ichiban! 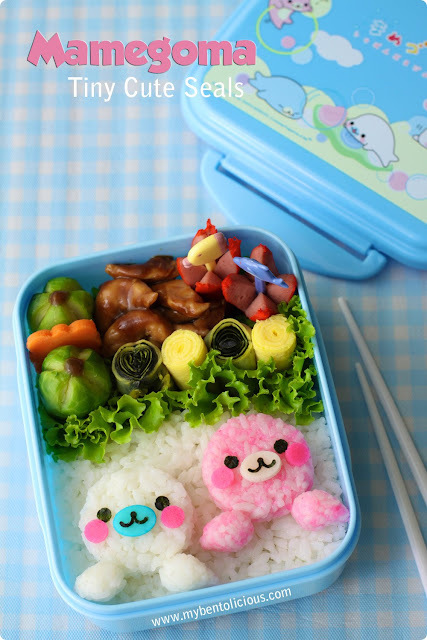 This is such a cute bento! Oh my~ this is super duper cute.. Your characters making is awesome.. There are lovely!lovely! and lovely!! Oh how cute!! I love the Mamegoma! Kidlet says he wants to come to your house for lunch lol. He loves cute animals! Your magical world of beautiful happy creatures makes me long to be a little girl again, Lia! Always uplifting and amazing! They are so sweet and cute Lia! You bento looks delicious as always! @Jenn : I will love to have Kidlet and you in my house. Sure it will be fun hehehe ... If you ever get a chance to visit Indonesia, please don't forget to contact me :) Thanks a lot Jenn! @bentobird : Thanks a lot Jenn for your kind words! Happy moments when was a little and being a young one really is surely something that we always treasure. @noobcook : Thanks a lot Wiffy! I think you've got more San-X stuffs in Singapore than in Indonesia.